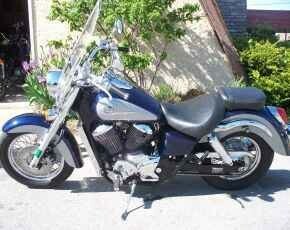 Many of you know I am the proud owner and driver of a 2001 Honda Shadow 750. I love it! I purchased it this summer from our friend Zac. To be quite honest, I still can’t believe that I was finally able to talk my wife into agreeing to the purchase, crazy!! Probably one of the best father’s day presents I’ve ever received…and it was a steal! I had to take it today to finish up my registration and title transfer. Did you know that you actually have to finish up applications, etc… when you do that? I’m sure you did…I’m sure I’m the only person in the world that was completely oblivious to this fact. So…after $400+ dollars in fees for not transferring it soon enough, I’m all legal and good to go. Whew… I know my wife is happy (not about the $400, but about the fact that I got it done). Afterward, as I was driving, I started thinking. Yes, I’ve been told that is a scary thing for me to do, but I was doing it regardless. The question running through my mind: What would happen if I wrecked this thing right now and I were gone. How would my family get by? What would be said about me after I was gone? I didn’t think this in a morbid/Emo kind of way…I thought it in a very rational/Daddy kind of way. OMG I’m that husband and dad aren’t I? My goodness…. As you know, along with Auto/Home/ and Commercial Insurance…I specialize in Life Insurance. September is Life Insurance Awareness month…seriously…it is. Do you have it? If not...why? Posted on September 15, 2011, in Uncategorized. Bookmark the permalink. 1 Comment. You’re absolutely right. I would even go so far as to say that one should buy more life insurance than s/he needs right now so that when that insurance is needed (due to vacation, birth of children, etc. ), it will be in place at affordable rates. We just bought a big policy (not big enough, but all we can afford) for my husband, and it cost a fortune because he now has medical conditions. Please, buy it while it’s cheap, and buy plenty. The uncertainty of always wondering what would happen if your spouse (or whomever you depend on) passed away can be huge, and if s/he puts life insurance in place, you will feel much more secure. Josh did not prompt me to say this; I speak from personal experience.